The hike from the parking lot to the ruins is less than half a mile and when you get to the dirt trail you will find numerous rocks, so watch your footing. This is a virtual cache and you need to know straight away that there is no ammo can or tupperware container to be found. This is a spectacular site to see! 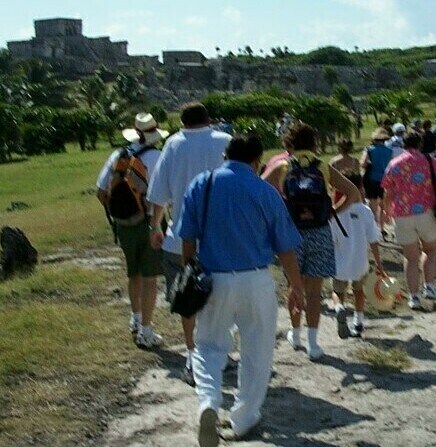 Tulum is an archaeological city the divinity of which - the sun was worshipped together with the rattle snake. This is a Geocache site that you definitely want to bring a camera and lots of film. It is hard to believe these ruins are here and that they have not been buried by time. If you would like a spectacular photograph of you and your family or you and your friends, ensure you walk behind the castle, because you will find the most beautiful green foliage and dazzling turquoise blues of the Caribbean Sea for a colorful background to your photograph. To log this find, either post a picture, or tell us via e-mail "who" swings on the ropes atop the large pole near the parking lot, or what cruise ship you were on to get here, or what airlines did you fly in on and which airport did you land? Or, did you walk or take the tram? You do not need to wait for a reply from us to log this find. We will notify you if you have not satisfied the requirements. "Edison Medicine": Anything that brightens your day is a good thing! Gurer vf ab uvag sbe guvf Trbpnpur. Jura lbh ner urer lbh jvyy xabj vg. Gurer vf ab jnl gb zvfgnxr vg. Unir n jbaqreshy gvzr! 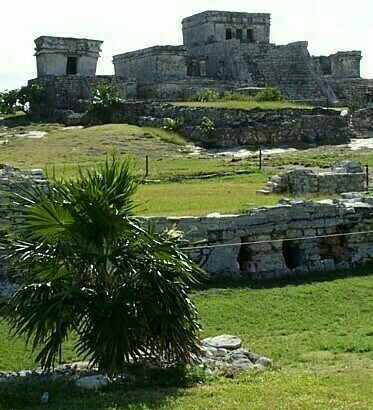 The Castle at The Tulum RuinsThe Castle is the large structure on the right that has steps leading up to it and there are 3 black rectangular entrances. The structure on the left is The Temple of The Descending God. House of the Northeast The structure in the foreground on the left is the House of the Northeast. The structure behind it is the House of the Cenote. The structure in the background on the right is a shrine and platform.